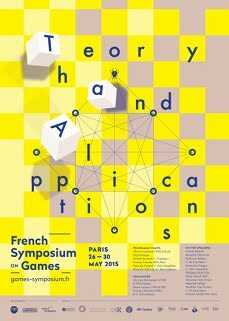 A new conference devoted to all aspects of game theory, from foundations to applications in Biology, Computer Science, Economics, Mathematics, and Physics. View the programme or download the schedule and the abstract booklet. The Symposium will be held at Université Paris Diderot in the Buffon building at 15 Rue Hélène Brion, 75013 Paris. View location in Google Maps and on campus plan. Buffet lunch is provided of Wednesday, Thursday, and Friday. A social dinner will be organised on Thursday evening. Registration closed on 21 May 2015. The Symposium is jointly organised by the GdR 2932 Théorie des Jeux, Modélisation Mathématiques et Applications, the labex ECODEC, and the labex OSE. We gratefully acknowledge support from the Program Gaspard Monge for Optimization, the EU project CASSTING, the ERC project GALE, and the GDR Informatique Mathématique. The conference poster was designed by podpunkt).